This SONGMICS kids' storage unit is a wonderful addition to any playroom and is a fun way to add extra storage space or display your little one's favorite toys! It has detachable storage containers and book shelves so that they can learn to retrieve and put away their books, toys and games by themselves, and the multi-tiered design makes it a real space-saving option. The unit is made of high-quality density fiberboard and is robust and sturdy whilst remaining lightweight enough to be moved if required. Finished in a durable non-toxic coating, the whole unit can be wiped clean which makes maintenance a breeze. 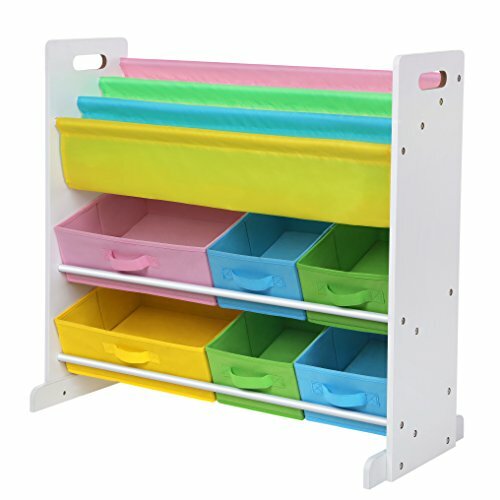 The anti-toppling straps included will keep the standing organizer stable and protect your kids from bodily injury. - Please clean this product on a regular basis. - Please place this product in a dry area and avoid direct sun exposure.